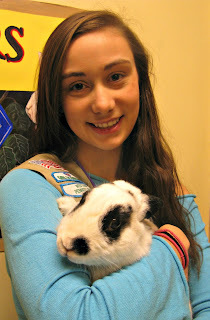 It was during the Chinese Year of the Rabbit in 2011 when our daughter had a creative idea for a Girl Scout leadership project. She wanted to write parody lyrics to a popular song and film animals acting it out to promote adoptions at Animal Friends. She was too young to handle dogs (need to be 18) or cats (16 for that), but at age 13, she was just right for the bunnies, provided a parent came too. If I came with her, she could have worked with the dogs or cats as well but she chose bunnies. No, I wasn’t kicking and screaming, because she is our youngest, and I realize the importance of nurturing our children’s dreams. So we signed up for Rabbit Wrangling I through IV, including Bun Runs--when all the rabbits jump around freely as visitors pat them--and a “Bunny Spa,” where we learned brushing, toe nail clipping and how to clean out rabbits’ scent glands. I could pass on that last one, but one more item my life’s resume! That was the best part. We met other child/parent teams, who mostly wanted to care for an animal that is prey to almost every other creature. We needed to attend a lot of bun runs, since Beth wanted to photograph the bunnies in action. It required a lot of patience on her part. After all, you can’t say, “Sit!” and offer a treat. Sometimes I arrived thinking, oh, I have so much to do at home, but often got caught up in watching the funny antics. I noticed each rabbit had a unique personality. Sunday, a black lop with a white heart on her nose, would run and skid to a halt—and Calamity Jack loved the attention of children. We all rejoiced the day he got a home! Our new friends loved the video clip where Beth’s voice said, “Come on Mig, run through the tunnel.” And he did! I noticed something else. The times when I had a hard time letting go of whatever it was that troubled my mind, it seemed the rabbits never came near. When I let go of wearisome thoughts, it seemed that was when a little furry creature quietly, and at first unnoticed, came by my side. “Last Friday Night—The Bunny Edition” with parody lyrics to the song by Katy Pery is finally finished and ready to launch on Animal Friends' YouTube. We plan to continue volunteering with the bunnies. We no longer rush by them on our way to visit the dogs or cats. And I will always treasure our memories of our “Year of the Rabbits” and their lessons in gentleness, as well as patience, they taught both of us. Click here to watch Beth's video and then visit www.ThinkingOutsideTheCage.org for a list of all the events happening during Adopt a Shelter Rabbit Month. Join us for one, two or all of our great bunny events. It's sure to be a hoppin' good time! Happy Tails: Kasper went home with our own Jeff!